"Dream High 2" will air its first episode on January 30. The KBS drama "Dream High", which gained great popularity, will air its second season under the title of "Dream High 2" from January 30. Many idol stars will appear as the cast members like the first season, but it will present a different storyline featuring confrontation between the students at Kirin Art School. The previous season mainly presented how the young students at Kirin Art School developed their dreams of becoming stars, but the second season will mainly deal with the confrontations between students who have already become stars and students who want to become stars. At the production presentation of "Dream High 2" held at the Imperial Palace Hotel in Nonhyundong on January 17, the president of one of the co-production company Holym, Jeong Wook, said, "We will present another story of dream and hope, and it will not follow the story of the previous drama, but it will become a story of young people who grow up as mature artists after going through confrontations while trying to express themselves. The story of the drama begins with the setting where the idols stars belonging to the huge entertainment agency, OZ Entertainment, transfer to the Kirin Art School which had gone through financial difficulties and happened to be taken over by OZ Entertainment. The huge agency unwillingly let their stars transfer to Kirin Art School due to the regulation that forces idol stars under the age of 18 to study. The drama will present the concept of competition to differentiate it from the previous drama that dealt with the students' challenge to become world stars. 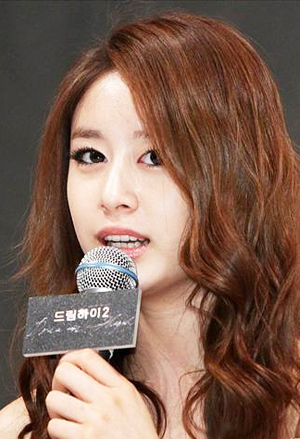 "Dream High 2" will present the competition between the idol stars and troublemakers at Kirin Art School. Actress Kang So-ra, who has gained popularity with her appearance in the movie "Sunny - 2010", and Jeong Jinwoon of 2AM will play troublemakers, and Jiyeon of "T-ara" and Hyolyn of Sistar will play idol stars. Kang So-ra will play a poor student who had studied music only from a book and is poor at giving performances. She entered Kirin Art School thanks to her good grade at school, but she became a problematic student as her practical skill of musical performance was too bad. She will later realize her genuine enthusiasm for music after meeting the other troublemaker Yoo-jin and the idol star JB. Kang So-ra said, "I do not feel pressure about the comparison with the cast members who appeared in the previous drama. I am filming this drama with my instinctive appearance as a troublemaker. I think that I have come to have this instinct that I did not have before (laugh)". Jeong Jinwoon will first try acting by playing a boastful troublemaker Jin Yoo-jin, who wants to become a rock star. Yoo-jin, once a child actor, has his dream in music while healing his heartbreak over his parent's divorce through music. Jeong Jinwoon said, "It is like studying something new every day. The atmosphere on the film set is completely different from that of the stage. I feel many difficulties from those differences, but I am trying to become accustomed to this new atmosphere". Jiyeon will play the idol star named Lian who is poor at acting and Hyolyn, who already proved her singing ability with her appearance in the program "Immortal Masterpiece 2", will play an excellent singer named Nana. Hyolyn said, "I continuously made mistakes by looking at the camera while acting and I became so cautious about looking at the camera that I even avoided the camera even on the stage. I feel pressure before the camera about controlling myself in both situations not to make any more mistakes". The top stars JB and Si-woo will be played my rookie singers JB and Park Si-woo, respectively. In addition, Yoo So-young, who once belonged to the group After School, and Kim Jisoo, who appeared in "Super Star K 2", will debut as actors by playing students at Kirin Art School. Park Jin-young will play the teacher Yang Jin-man again. He will teach music and dance at school. The dancing queen, Kahi, of After School will play the dance teacher, which has attracted attention. Kahi said, "I had thought that playing a dance teacher who was once an idol star would not be very difficult, but actually it was very difficult to act in front of the camera, understand emotion, and express feelings. I am trying my best to learn those things, but I do not know whether I can do it very well". She revealed her pressure about acting and continued to talk about her feelings about working with the former member Yoo So-young, saying, "I found out the fact that I would work with Yoo So-young at the first meeting with the director. I was really happy to meet her again. We have not talked for the past three years while we were going through many things without talking to each other, and we could find out many new things about each other. I appreciate the fact that I could improve my human relationships thanks to 'Dream High Season 2'". Kim Jung-tae will play the board of director of Kirin Art School, and Choi Yeo-jin will play a singing teacher. Kim Jung-tae said, "I worried about the fact that I have a huge age gap with the other junior actors, but I am filming this drama comfortably. But the young actors are going through difficulties on the film set due to the cold weather. They are working very hard in a difficult situation". He encouraged the junior actors. Choi Yeo-jin said, "I was asked to play a dance teacher at first, but I wanted to play a delicate character because I already played many strong roles before. I had wanted to become a singer when I was young and I really anticipate that I might be able to achieve my dream through this drama". "Dream High 2" will be broadcast every Monday and Tuesday at 9:55 pm on KBS 2TV.